Looking for the paperclips. Here they are! Just what your desk needs. This female will make you smile! Looking for the paperclips. Here they are! Just what your desk needs. This female will make you smile! Handcrafted in the USA by Amy Hardacre. 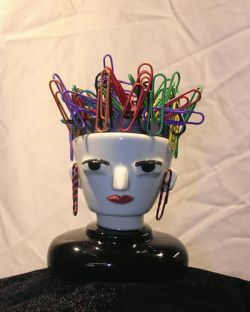 Ceramic paperclip holder. The head is magnetic.